The Hotel Lucciola di Cattolica is a small, family-run 2-star hotel with 30 spacious and bright rooms in a pedestrian area. At guests' disposal: family atmosphere, cuisine taken care of directly by the owner, an outdoor space furnished with care and overlooking Viale Dante. 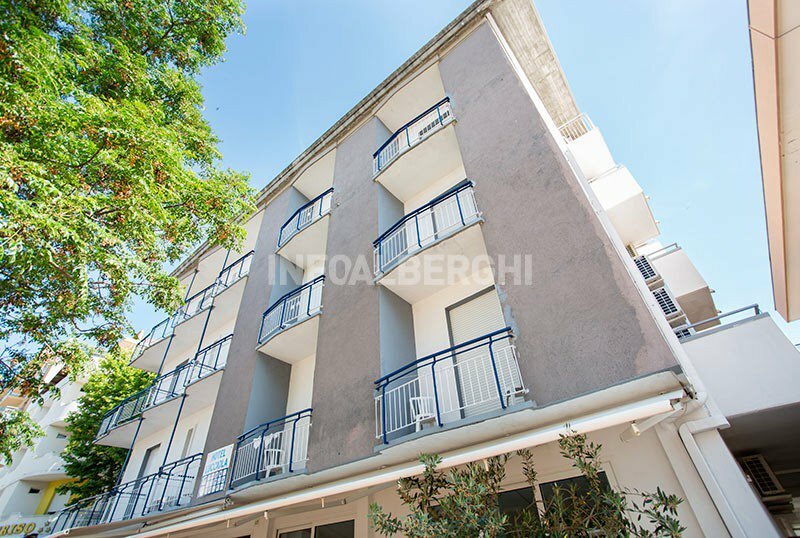 The hotel is located in Viale Dante, a tourist and pedestrian area of Cattolica, a few steps from the center on one side and the Le Navi Park on the other. The area is well served and full of shops and restaurants. The sea can be reached in less than a minute on foot. All rooms have a balcony, ceiling fan, air conditioning, satellite TV and digital terrestrial, WI-FI, safe, direct telephone and bathroom with hairdryer and shower. On request: minibar. FAMILIES: triple, quadruple and interconnecting rooms are available. APARTMENTS: for those who want comfort and privacy, there are small apartments with 2 bedrooms (each with a balcony) and a fully equipped bathroom with shower. Equipped open-air porch, terrace, air conditioned dining room, elevator, TV room, night porter, luggage storage, 24 hour bar service. PARKING: fenced, free covered and uncovered 800 m with shuttle service. AIR CONDITIONING : free in the common areas and in the rooms. CONVENTIONS: with beach, amusement parks and shuttle service. BREAKFAST: in the morning homemade cakes and pies, ring-shaped cake, biscuits, cakes, brioches, yogurt, fresh bread, fruit, jams, honey, juices and a savory corner with cold cuts, cheese and eggs. LUNCH AND DINNER: every day 2-choice menus are prepared with meat and fish specialties. Among the proposals are never missing homemade pasta and the best recipes of the Romagna tradition, appetizers and vegetables buffet, fruit and desserts. VARIATION: vegetarian dishes on request. At meals: high chairs at the table, baby food, dedicated menus on request, flexible hours. At the beach: baby / mini / junior club. The hotel has an agreement with the beach 86-87-88, a large and modern establishment with many amenities including swimming pool with hydromassage pool, entertainment with baby-mini-junior club, WI-FI, children's playground, fitness area, gym, beach volleyball courts, bocce courts and ping-pong. Prices are per person per day for a minimum stay of 3 days. TAX: The tourist tax is € 0.50 per day per person for the first 7 days of stay. Children under 14 are exempt. It will not be calculated in the account dell'HJotel but will be added separately.